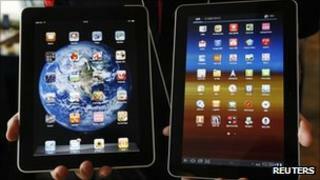 A South Korean court has ruled that Apple and Samsung both infringed each other's patents on mobile devices. The court imposed a limited ban on national sales of products by both companies covered by the ruling. It ruled that US-based Apple had infringed two patents held by Samsung, while the Korean firm had violated one of Apple's patents. The decision comes as a jury in California is deliberating on a patent trial between the two firms in the US. The sales ban will apply to Apple's iPhone 3GS, iPhone 4 and its tablets the iPad and iPad 2. Samsung products affected by the ban include its smartphone models Galaxy SI and SII and its Galaxy Tab and the Galaxy Tab 10.1 tablet PCs. The court ordered Apple to pay 40m won ($35,000; £22,000) in damages to its South Korean rival, while Samsung was told to pay Apple 25m won. The awards are dwarfed by the damages being sought by Apple in its case in California. It is seeking more than $2.5bn (£1.6bn) from Samsung, for allegedly violating its patented designs and features in the iPad and iPhone. A Samsung spokesperson told the BBC that the court had found the South Korean firm guilty of violating Apple's patent relating to the "bounce back" function. The function lets users know that they have reached the end of a screen that they may be scrolling through on their devices. Meanwhile, Apple has been found guilty of violating patents relating to telecom standards held by Samsung, including technology that makes the transfer and transmission of data between devices more efficient. However, the court ruled against Apple's claims that Samsung had copied the designs of its products. "There are lots of external design similarities between the iPhone and Galaxy S, such as rounded corners and large screens... but these similarities had been documented in previous products," a judge at the Seoul Central District Court was quoted as saying by the Reuters news agency. "Given that it's very limited to make big design changes in touchscreen based mobile products in general... and the defendant [Samsung] differentiated its products with three buttons in the front and adopted different designs in camera and [on the] side, the two products have a different look," the judge said.